Thinly slice turkey. 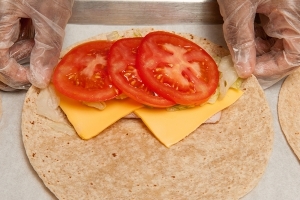 Weigh 2 ounces to determine portion size for each wrap. CCP: Cover and refrigerate at 41 degrees F or lower until ready for sandwich assembly. Rinse tomatoes under cool running water, drain, core, and thinly slice (8 slices per tomato). Lay out flour tortillas on a clean work surface area. 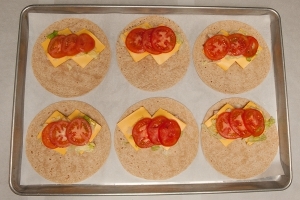 Layer 2 ounces of turkey, 1 ounce of cheese (two ½ ounce slices), ¼ cup of shredded lettuce and 3 tomato slices on each tortilla. 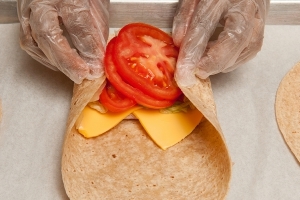 Fold 2 sides of wrap 1 inch over filling. Roll tightly as for jelly roll, starting to roll from side and over filling. Cover with plastic wrap and place under refrigeration until ready for service. CCP: Hold under refrigeration (41 degrees F or lower) until ready for service. Check temperature every 30 minutes. 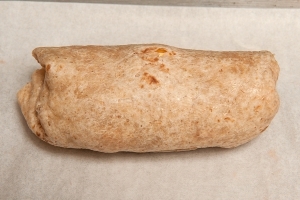 Portion 1 wrap (2 halves). Each portion provides 3 oz. eq. of meat/meat alternate,1¾ oz. eq. of whole grains, 1/8 cup of red/orange vegetable and 1/8 cup of other vegetable. CCP: Hold under refrigeration (41 degrees F or lower) until ready for service. Check temperature every 30 minutes. Cover, label, and date any leftovers. Use USDA Foods products when available. 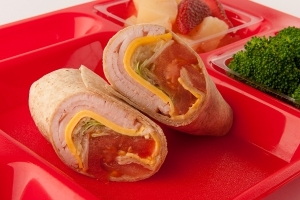 "Culinary Techniques for Healthy School Meals" provides seasoning and serving ideas for sandwiches. 1 serving of Turkey and Cheese Wrap. Each sandwich could be wrapped in deli paper before slicing.